I received very valuable feedback for my initial post first published in LinkedIn Pulse. One of the questions was about using the derivatives and structured products. Below I have provided some additional considerations. I think that the structured products should not be included in retail portfolios because people do not understand the risk-return profile of these products. For an example, the structured equity products are typically marketed as “market-participation” products with certain upside or downside potential. However, the long-term performance of an equity structured product is not linked to the performance of the equity market, instead it is linked the volatility risk premium, which is roughly the spread between implied and realized volatilities. However, whenever an investor buys optionality from a broker, he overpays for it compared to the price implied by exchange listed options. And vice versa, when the investor sell optionality he sells it at a very small volatility. Given that the investment decisions are taken sporadically and near market tops, investing in structured products becomes a gamble on the stock market and, as a result, the investment performance is doomed to failure in the long run. Instead, investing in derivatives should pursue the goal of earning the volatility premiums and the investment should be implemented through a rule-based systematic strategy trading in exchange-traded options. 1) The core investment strategy targeting blue ship companies with solid fundamental and top-line growth and above-average dividend yields. The key here is to re-invest the dividends and let the compounding work for you in the long-time. I already mentioned in the interview that dividends and dividend growth account for 80-90% of total return in the long-time. Yet, dividends and long-term compounding are ignored by traditional advisors and asset managers. 2) Volatility risk-premium harvesting through selling optionality through exchange traded contracts. 3) Credit risk-premium harvesting through trading in either bonds or bond ETFs. Volatility and credit risk-premiums are persistent and they represent a (over-priced) compensation to bear losses when the market transition from a low volatility regime to a high volatility regime. These strategies should be implemented as portfolio overlays to smoothen the macro volatility and applied in the investment protfolio using a risk-controlled allocation method. Looking at solutions offered by wealth and asset management industry, there are not that many options oriented towards long term investing. Let’s look, for an example, at exchange traded funds oriented towards dividend investing. Well, there are a few products, but they are either over-concentrated to one or two specific sectors (like utilities), or they have too big weights of sectors which are sensitive to economic cycles (like energy and financials). Moreover, these ETFs don’t take into account that it is the dividend growth that matters in the long-term and not the current dividend alone. Volatility and credit risk-premium investing is typically marketed as an alternative investing and it is implemented through allocations to hedge funds. 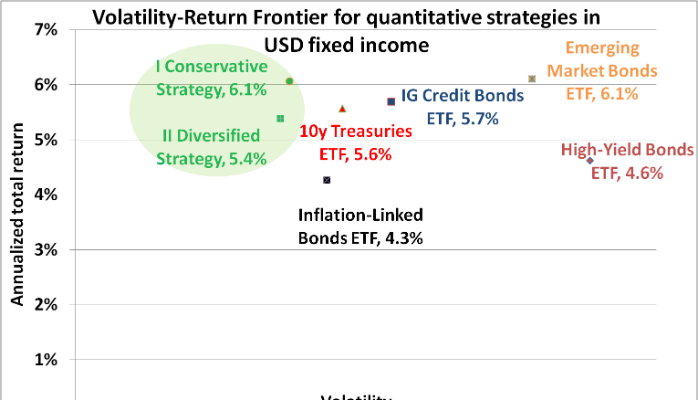 However, the nature of these strategies is that they should be systematic and implemented as portfolio overlays because “unleveraged” returns from these strategies may not be too attractive, so people tend to increase the leverage. However, with higher leverage comes the tail risk which is very expensive to hedge. When implemented as portfolio overlays with allocation to “safe-haven” assets, the total portfolio may offset macro risks and earn an attractive overall return in the long-term. Finally, I need to mention the factor-based investing, which is very topical and yet too young to form a strong opinion about it. I see a big potential of factor based investment. However, factor-based investments is based on a purely quantitative solution in selecting investments and allocating the capital, so that it is not far from models I was mentioning. In fact, volatility and credit risk-premiums should also be viewed as a part of factor-based asset allocation. To conclude, I see the big value in quantitative investment models for managing personal retirement and savings as these models enable to focus on the long-term goals. When equipped with proper risk-control asset allocation methods, these models allow to leverage the compounding effect and earn the volatility and credit-risk premiums in the long-time. In general, it is my feeling that people are underestimating the future periods of low interest rate, economic growth along with toppish valuations we see today. In the best case I expect total return of 3% for a balanced 50%-50% bond-equity portfolio. The next important question is then becomes the management costs: does it costs 2% or 1% or 0% makes a huge difference in the long term. Following my example, for a portfolio providing annual return of 3% with 0% fee, it takes 25 years to double the original investment. The same portfolio but with 1% fee takes 37 years to double. Finally, for a portfolio providing 3% at a management cost of 2% it takes 71 years to double (nearly three times more than for portfolio with zero costs). For the long-term investing and retirement planning, compounding is a crucial factor, especially so in the world with declining future returns. Now, an investor will face two choices. On one hand, he can hire an expensive advisor to get a recommendation to buy a “hot” stock or an “attractive” structured product. On the other hand, he can go for a quantitative tool that designs your portfolio with respect to both long term objective and also taking advantage of medium term volatility and which is yet reasonably priced. My personal choice is to go for a quantitative model. What would you choose?